Energized by Norway’s biggest bank pulling out from funding Dakota Access Pipeline, while Pilgrim Pipelines begins to lose funding too, we can all take action by pressing banks and financial institutions to divest from and defund new fossil fuel pipelines everywhere. On horseback at Standing Rock, protesting DNB (Norway’s biggest bank) funding for Dakota Access Pipeline. Photo by Adam Alexander Johansson, from YES Magazine. Here are CEO names, emails, and phone numbers—because banks have choices when it comes to what projects they give loans to. “I Couldn’t Go to Standing Rock, So I Closed My Bank Account Instead,” published just five weeks later, shows activists’ deepening commitment: don’t just call a bank’s CEO, pull your own money out from that bank while you’re at it. The list of banks funding DAPL has grown as well: “There are 38 banks supporting the Dakota Access pipeline. I found out mine was one of them,” begins this essay’s author Cedar Wilkie Gillette. The movement at Standing Rock unifies and connects our commitment to protect water, climate and future generations with our commitment to indigenous peoples’ rights, human rights, racial and economic justice, and gender justice. That’s what makes this movement so diverse, so unified, and so strong. Times Square Action Confronts Ares, the Big Money Behind Pilgrim Pipelines. October 26 2016: Photo by Peter Hart, published by Food and Water Watch. Since Coalition Against Pilgrim Pipelines in New York (CAPPNY) and New Jersey (CAPP) have done phenomenal work getting over 100 resolutions and ordinances passed opposing Pilgrim to protect human health, drinking water, climate, and the environment in both states (most but not all Resolutions listed here), and have specifically gone after Pilgrim’s major funder, Ares Management and Ares Management EIF Fund, this slowdown in Pilgrim’s funding came as a Thanksgiving surprise. The big action targeting Ares took place while I camped at Standing Rock in October. Several CAPPNY organizers, including Joe Barbarito of New Paltz Climate Action Coalition, Stacy Lipari from Rosendale, Sue Rosenberg of Coalition Against Pilgrim Pipelines-Saugerties, and myself, have traveled separately to Standing Rock to directly participate, donate, build bonds with and support the Water Protectors there between September and November, even while developing the Coalition Against Pilgrim Pipelines back home which continues to make it impossible for Pilgrim Pipelines to be permitted or built. Right now, in short, the Pilgrims are finding it harder to dominate, while indigenous peoples have captured hearts and minds with brilliant, creative, deeply spiritual and profoundly nonviolent leadership at Standing Rock. It’s up to all of us allies and organizers to build on this positive momentum by standing with Standing Rock, pushing financial institutions to divest and defund fossil fuel pipelines, create climate justice, and protect frontline communities everywhere. The dangerous Dakota Access Pipeline, and the brutal repression unleashed on its behalf, is countered by a greater force. To me, among a multitude of outstanding positive qualities I was lucky enough to observe continually while camping at Oceti Sakowin camp for one week, the most inspiring aspect of the indigenous-led Water Protectors’ struggle at Standing Rock is courage. Steve Horn quoted Benjamin in his Counterpunch investigative article, “Security Firm Running Dakota Access Pipeline Intelligence Has Ties to U.S. Military,” published October 31st 2016, while I was still living at Oceti Sakowin camp. Throughout my time at Standing Rock, I kept thinking “these guys behave more like a paramilitary force, this feels more like low-intensity warfare against a whole people,” rather than mere private-property defense in the usual sense. TigerSwan is a key part of the escalated, large-scale militarized police aggression against indigenous people and their allies at Standing Rock. Some of us allies who arrived after police arrested 140 water protectors on Saturday, October 22nd may have had the illusion that the worst had already happened. On Wednesday night, October 26th, after my friends and I pitched our tents at dusk, we were called to the frontline camp — the northern camp known as the “1851 Treaty Camp” which Lakota leaders claimed by eminent domain. These tipis, tents and prayer circles directly blocked the route of the Dakota Access Pipeline, on land the corporation had bought but which was actually owned by the Standing Rock Lakota according to its 1851 treaty with the U.S. government — a treaty broken by the U.S. government. I took two men to the 1851 treaty camp, all of us trying to figure out if we could be of use amidst rumors that the police assault would happen overnight. When they decided to get some sleep, I brought them back to camp but answered the call when another request went out to bring more Water Protectors to the frontline camp. So I brought two more men to the 1851 treaty camp, and while we assessed the situation one of them, a gentle, soft-spoken Havasupai man — a firekeeper who seemed to never meet a person he did not immediately help in some way — told me his story. He was arrested while engaging in peaceful nonviolent protest on Saturday October 22nd. Thrown to the ground, he found himself motionless on his back while a large policeman ground his knees painfully into his ribs. He heard another policeman screaming at him, “Turn over! Turn over!” which he could not possibly do as the big policeman bore down with rib-cracking force on top of him. Eventually the officer let up his knee pressure long enough to let him turn over. After that he endured two days in jail with no medical care, and here he was on the frontlines. Later that same night, my new Havasupai friend stood with me in the cold, cracked ribs and all, while I tried to text-guide an even newer arrival to a tipi where my Lakota friends had offered sleeping space. He stayed patiently for a full hour in the cold and dark until my missing crew member finally appeared, showing above-and-beyond consideration and hospitality in keeping with the theme of the whole camp: we are all Relatives. The next day, I was glad to be of use, taking him to the Indian Health Service in Fort Yates for an X-ray to document the fractured ribs, while the next major police assault was underway. Mainstream media failed to cover the police and National Guard aggression against the 1851 Treaty Camp Thursday, October 27th, during which police used batons, mace, rubber bullets, sound cannon, tasers, and physical force against people plus taser and rubber bullets (some said live ammunition) against a horse, who later died. Militarized police also rammed a horse with an ATV. Myron Dewey, Indigenous Environmental Network, and other indigenous leaders did an incredible job documenting the assault on Facebook. One non-Facebook site documenting much of what happened that day is Unicorn Riot, with dozens of photographs and video despite Unicorn Riot journalists themselves being assaulted, they reported at about 4:45 pm. A post from Uncensored News, “Morton County Sheriff and Violent Gang of Police Targeted And Arrested Medics While They Were Treating Patients,” documents the targeting of medics including the moment when a woman medic wearing a red cross, driving a car clearly marked with a red cross, was ripped out from behind the wheel of the car she was driving, thrown down and roughly arrested while the car was still moving, putting many people at risk. I’ve seen that arrest on video and spoken with eyewitnesses. One of the most disturbing things about it is that a masked man, his face covered with a black mask and goggles so that no skin anywhere on him is visible and his eyes are invisible too, walking in fatigues with the militarized police, shouts “she needs to be arrested.” The officer immediately in front of the masked man obeys the order, abusing the medic and disregarding the safety of everyone in front of the car while he pulls the medic out of the car she is driving. Who is that masked man? Why did police obey him, endangering everyone in the path of the car? This is a taser barb removed from the cheek of a protester opposing the Dakota Access Pipeline. Posted by Wes Enzinna on Twitter 10/28/16. In total, for Thursday 10/27 alone, the Standing Rock Sioux Tribal Council paid $173,000 for bail and another $80,000 to get back the 100 cars impounded by police near the 1851 Treaty Camp. On the Sunday before Thanksgiving, police assaults escalated even further. Not only did Morton County Sheriff’s Department and militarized police spray protectors with water cannon in sub-freezing weather, but medics reported that they sprayed mace in such high concentrations in such a short period of time that people lost bowel function, vomited, and one person had a seizure. One elder went into cardiac arrest and had to be revived with CPR. The Water Protectors were nonviolently dismantling the burned trucks sitting on the bridge not far from the main Oceti Sakowin camp, in order to increase the access to the camp for emergency and safety vehicles and in order to stop the police barricade which was inconveniencing local ranchers and area resident when the Sunday night police assault occurred. They parked their armored cars on the graves of Matilda Gaplin, Eagle that Looks at Woman, and with her are her daughters Louisa DeGrey Van Solen and Alma Parkins who once owned the Cannon Ball Ranch. Next to her is her husband Charles Parker, and 11 babies. These are famous people for us here in Indian Country. Matilda was the only woman to sign the Fort Laramie Treaty of 1868. Louisa was the first school teacher on Standing Rock. I am deeply hurt to see the desecration of their graves. The Native American women leading the Standing Rock protests against the Dakota Access oil pipeline say they have faced police abuse and mistreatment in jail. North Dakota’s militarized law enforcement has left many of them traumatized. ‘They came with their guns, their weapons and violence and put it on a peaceful people,’ says Lauren Howland, a member of the San Carlos and Jicarilla Apache tribes and Navajo Nation. Strip searches are being used routinely. One 18 year old indigenous woman said, with gracious understatement, “It made me uncomfortable. It hurt my dignity.” As a white woman arrested for nonviolent protests in Florida (opposing the launch of the Trident II D-5 nuclear weapon); Washington D.C. (for sitting down in front of Citibank during anti-apartheid protests and years later for a large gay rights civil disobedience action at the Supreme Court) and Philadelphia (for urging Army Recruiting stations to stay out of Iraq) I have never been strip-searched. Never. Ever. Nor was anyone I was arrested with. Why is North Dakota in general, and Morton County in particular, going out of their way to use humiliation as a tool of repression? To be honest, I can’t say that I personally was all that courageous during my week at camp. I helped people. I chopped potatoes. I helped elders get needed rest and showers. I listened a lot. I gave all the gifts — insulated winter boots, pre-paid VISA cards, cash, sub-zero winter sleeping bag, coffee, sugar, good winter coats and other winter gear — with which people in the Hudson Valley of New York, especially folks fighting the proposed Pilgrim Pipelines, showered me before I left — focusing on support for long-term campers, not weekend visitors. I gave rides. I helped a few people figure out where the medic tent was and how to get the help they needed. I helped Helmina Makes Him First buy supplies for fry bread and soup she brought to Winona’s Soup Kitchen, a traditional Lakota kitchen which feeds 350 people a day. I went to the front lines a bunch of times but was never there when the rubber bullets were flying. No wounds, not even a little mace, and no strip-searching for me. Just a lot of smoke — sage and firewood — in my eyes. But courage was all around me, all the time. Courage filled the feet of Abe, a Lakota man of the Cheyenne River band, so elderly that his grown daughter, Winona, tried to make him agree to stay away from the front lines. But Abe was always at the frontlines, no matter that walking was difficult for him. Courage filled the voices of all those who defused the dangerous situation where a DAPL security worker who brought three weapons and tried to enter the main camp; Ryan Redhawk narrates that conflict in full here. Courage filled the hearts of all the water protectors who attempted to protect the Standing Rock burial sites and sacred sites from DAPL bulldozers on September 3rd, enduring mace and terrifying biting dogs, but who pushed back with nothing but their bodies and their shouts. Courage filled the life of Caro Gonzales, member of the Chemehuevi Tribe, who in spite of the advancing lines of police, told the police “those are grandmothers’ bones you are digging up,” praying and attempting to offer tobacco, as a prayerful offer to the Creator. Police stomped her arm “trying to get the tobacco out of my hand,” Caro said. “Two women told me to take my clothes off… I asked them to look away, they said we’re going to stand here and watch you… I said I’m sorry but I’m not going to do that for you. They dragged me into another cell with male officers, where they ripped my clothes off of me…. Now I don’t remember everything, from then I was traumatized, I have flashes remembering….” Listen to the courage in the voices of the women. Yesterday, Friday November 25th 2016, the day after Thanksgiving, the Army Corps of Engineers gave an eviction notice for the whole main Oceti Sakowin (Seven Council Fires / Great Sioux Nation) camp. Both Dave Archambault of the Standing Rock Sioux Tribe and the Cheyenne River Chairman Frazier wrote eloquent letters calling for the Army Corps to protect the water and human rights by rescinding permits already given to DAPL and by refusing to give the final easement DAPL needs to bore under the Missouri River, rather than by enacting yet another forced removal of indigenous peoples from their own lands, promised to them by treaties never honored. But the day before the eviction notice would take effect, hundreds of veterans who have served in the U.S. armed forces will arrive at Oceti Sakowin camp. And the camp has already grown to about 3,000 participants following the brutal crackdown with mace, rubber bullets, water cannon and concussion grenades on Sunday night November 20th. The courage, compassion, spirit, creativity, resilience and persistence of the people, indigenous-led and ally-rich, continues to grow. A Facebook page for the event, Veterans Stand for Standing Rock, has more than 600 confirmed reservations with more than 4,500 other people expressing interest. High-profile veterans including U.S. Rep. Tulsi Gabbard of Hawaii and retired Baltimore police officer/whistleblower Michael A. Wood, Jr. plan to attend. From Hundreds of Veterans to Join Water Protectors at Standing Rock to Protest Dakota Access Pipeline (EcoWatch). The call to Stand With Standing Rock is a call to hearts and minds everywhere. Water Protectors at Standing Rock: “Respect Indigenous Rights,” “Defend the Sacred,” “Water is Life.” Women on front lines. Photo from Democracy Now, October 17th 2016. Allies are needed at Standing Rock in North Dakota. Civil rights violations perpetrated by the Morton County Sheriff’s Department are escalating along with increased surveillance and militarized police aggression, while water, land and people are threatened by the Dakota Access Pipeline, and treaties made with First Nations have never been honored. I will head out with a small crew, to take a stand for Standing Rock, next Monday, October 24th, assuming my bronchitis eases up — don’t tell me, I know it’s cold out there — after helping with fundraising, action alerts, and shipments of sleeping bags, warm blankets and coats, first aid kits and herbal medicines requested by the medics at Standing Rock in September and October. From Indian Country Today, Courtesy of Indigenous Environmental Network: Young Rita Waln led a procession of women and children who shook hands with officers at the ND Capitol after they held a demonstration to deny charges that weapons or pipe bombs were at the Lakota encampments along the Missouri River. About 200 water protectors took their message of peace to the governor that they are unarmed and peaceful. August 23rd, 2016. Next, make four phone calls. Call Morton County Sherriff’s office (701) 667-3330 to demand the rights violations cease. Democracy Now reported this morning (link above) that the Morton County Sheriff’s department strip-searched the daughter of LaDonna Bravebull, the Sacred Stones Camp founder, in front of several male officers and left her naked in a freezing cold cell for hours. They asked her, “who’s your mother?” This sounds like torture, not community protection or upholding the law. Intimidation on behalf of Energy Transfer Partners, the company trying to build a massive Bakken Shale fracked oil pipeline just feet from the Standing Rock Sioux Reservation, threatening the Missouri River and the reservation’s drinking water as well as every community downstream. 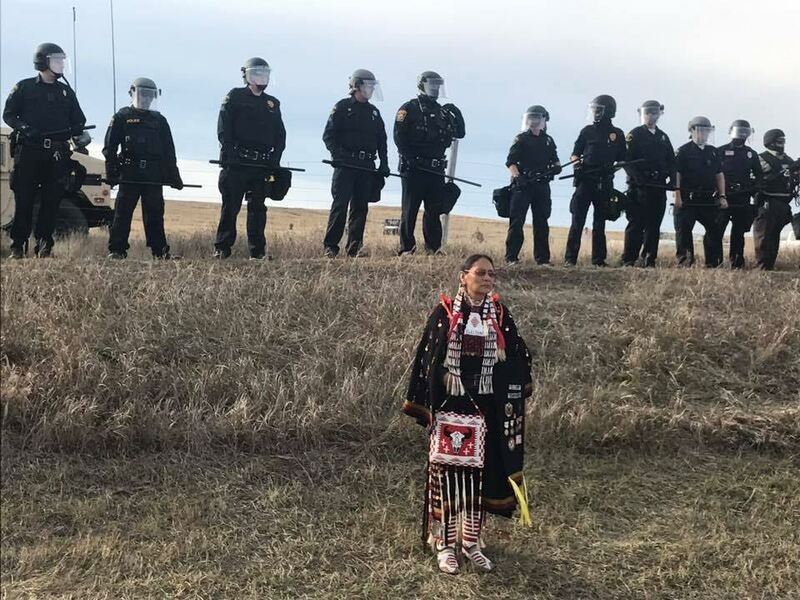 Next call North Dakota Governor Jack Dalrymple (701) 328-2200 and President Obama (202) 456-1111 or (202) 456-1414 to demand the Dakota Access Pipeline construction cease permanently and to demand an end to human rights abuses: protect the Water Protectors, don’t abuse them! Finally call the Army Corps of Engineers (202) 761-5903 to thank them for temporarily refusing the permit for the Dakota Access Pipeline to drill under the Missouri River, and to urge them to make that permanent. Photo from Indian Country Today, courtesy Indigenous Environmental Network. After Morton County Sheriff Kirchmeier said his agency received reports of pipe bombs [which turned out to be nasty rumors planted when water protectors discussed peace pipes], Lakota people firmly denied those allegations and sent peaceful messages from elders, youth and women. August 23rd, 2016. Because the construction is allowed only due to mis-use of the Nationwide Water Permit law, which allows legal fragmentation so that no Environmental Impact Statement has had to be created for the Dakota Access Pipeline, all construction activity is actually illegal as well as destructive to life, and must be stopped. Why should all this damage be done to sacred burial grounds, to the land and to people’s lives, when the pipeline will never be drilled under the Missouri River anyway? All construction must halt and permission to drill the Dakota Access Pipeline under the Missouri River must never be granted. Expressions of solidarity with Standing Rock are extraordinary. It is a time to unify and celebrate as well as to stay informed, take action, donate, and resist. In this phase of the fight for climate justice, clean water and human rights, we need to become adept at working on several fronts simultaneously. The fight against the Dakota Access Pipeline’s East Coast counterpart, Pilgrim Pipelines — proposed to carry Bakken Shale crude out of Albany, NY brought to Albany from North Dakota’s fracking shalefields by oil “bomb trains,” — continues. Please prepare now to write your own public comments during the scoping phase of the New York State Environmental Quality Review, to begin imminently. Check the Coalition Against Pilgrim Pipelines website frequently, along with Riverkeeper, Scenic Hudson, and Protecting Our Waters, for updates. We take leadership from indigenous people, people of color and frontline communities, which now also include massive numbers of white and middle-class communities. Frontline communities are those directly facing fracking, mountaintop removal, tar sands extraction impacts, spills and explosions from existing and new shale oil, dilbit, gasoline, fracked methane, and fracked NGL pipelines; polluting refineries, compressor stations and pump stations, export facilities on all our coasts, and bomb trains. Ultimately, while the sheer number of frontline communities expands, we are one people in one struggle for a sane, liveable, humane future for ourselves and all species. The fight for dignity, sovereignty, human rights, climate justice, human and ecological health, and at the core, clean water, sacred water, at Standing Rock is everyone’s fight. You can donate directly to the Standing Rock Tribal Council here. If you know me from my seven years’ anti-fracking and anti-pipelines work to protect water, health, climate, and human rights (or from my decades of work for nonviolence, against sexual assault; for peace, against racism, for indigenous peoples’ rights, before that), and would like to support this trip, please call (215) 840-6489 [cell] and (845) 687-7810 [land], to learn how to donate. Please leave your name and return call number(s) on both lines. I know it’s a pain, but we want to be secure and do not have a way to accept credit card donations. Thank you for considering supporting this little crew. Protecting Our Waters has been saying for 7 years that we — and you — are Protectors, a word now heard around the world as the Lakota Water Protectors hold the front line. The concept for the founding of Protecting Our Waters came directly from the Thirteen Indigenous Grandmothers, who said: “Protect something. Pick something — seeds, land, a species, a place, a waterway — and protect it.” It’s simply what we all need to do. Rensselaer, NY: On Wednesday, July 20th the City of Rensselaer Common Council voted 5:0 to pass the Resolution Opposing Pilgrim Pipelines, becoming the fourth and final city on the proposed oil and petroleum products pipelines’ direct route to oppose permitting or construction of the pipelines. The cities of Albany, Kingston and Newburgh had already passed Resolutions Opposing Pilgrim pipelines. The Common Council found opposition to Pilgrim pipelines running 21:1 in the city of Rensselaer. Rensselaer is now the 28th Hudson Valley municipality (including towns, cities and villages but excluding counties) to pass a resolution opposing Pilgrim pipelines due to health, safety, environmental, drinking water, climate and energy policy, and economic concerns. The total proposed Pilgrim pipelines’ length, including laterals, is 352 miles in both states. Both proposed pipelines would be drilled horizontally underneath the Hudson River twice. Five voted “AYE” to the Resolution Opposing Pilgrim Pipelines: James Van Vorst, John DeFrancesco, James Casey, Margaret Van Dyke, and Common Council President Brian Stall. Two abstained: Dave Gardner, who said he “wanted to hear from DEC,” and Richard Mooney. By passing the Resolution Opposing Pilgrim Pipelines, Rensselaer joins Albany and the towns of East Greenbush and Bethlehem in united opposition to the proposed Pilgrim pipelines throughout the Capital District, in every Capital District municipality along the direct proposed pipelines route. Several Capital District residents also spoke. At least eighteen people testified at the Common Council meeting. At least fourteen strongly opposed the Pilgrim pipelines. Four people, including lobbyist John Casellini, testified in favor of the pipelines; at least two of those represented Local 190, calling for construction jobs. The controversial pair of proposed Pilgrim pipelines would carry Bakken Shale crude oil from Albany to Linden, NJ. Pilgrim’s construction would require an increase in oil train traffic into Albany threefold to fivefold, compared to the current (fluctuating) number of oil trains entering Albany, in order to service the southbound crude oil pipeline. Rensselaer, New York “We have to put our foot down,” said Pablo del Gallego, who literally had the last word at the City of Rensselaer’s Public Hearing on the proposed Pilgrim Pipelines this Wednesday, June 15th. “Oil is on the way out. Being a taxpayer, homeowner, etc. here, I don’t like these pipes, they will break and fail,” Pablo predicted. Rensselaer’s Common Council listened closely, having organized the Public Hearing to “take the pulse” of the community. residents packed the small City Hall to speak about the Pilgrim oil pipelines. Common Council President Brian Stall called for those in favor of the pipelines to speak first, and only one resident spoke in favor, hoping for construction jobs. Another construction trade union representative spoke next, also in favor; he was not a resident of Rensselaer. Then 16 opponents of the proposed pipelines spoke, and it became clear that Rensselaer is an environmental justice community whose residents are deeply fed up with polluting industries being imposed on them. A Harvard analysis, “OIL: the Life Cycle Analysis of its Health and Environmental Impacts,” supports Marion and others who commented about health impacts. Many people, including Kate Hudson, Director of Cross-Watershed Initiatives for Riverkeeper, testified about the physical dangers and the extreme threats posed by drilling two pipelines– one would carry crude oil, and one would carry refined petroleum products — under the Hudson River twice. Some made phone calls or wrote to the Common Council to make their views known. Rensselaer is directly across the Hudson River from the City of Albany, which voted 9:0 in favor of the Resolution Opposing Pilgrim Pipelines on May 16th, just one month before Rensselaer’s hearing. The Pilgrim Pipelines proposal is contrary to the PSC plan to have NYS’s energy supply to be 50% fossil free by 2030. Your children and my grandchildren need to be protected from the impacts of climate change by your responsible actions. PLEASE reject the Pilgrim Pipeline proposal! Please take responsible actions and transition from fossil free fuels NOW. Remember all the explosions from this Bakkan oil. Please do not be rolled over by the promise of money/jobs when clean water, air, soil, life are at stake. We are coming up on the 3rd anniversary of the explosion in Lac Megantic, Quebec where 47 people were incinerated. Please DO NOT support this horror for Albany and Rensselaer. It is your responsibility. Just as we transitioned from sea oil to land oil in the 1850s, we are well beyond time to transition from land oil to renewables. On Wednesday night, June 15th 2016 in the City of Rensselaer, home to Monolith Solar and Garelick Farms among other successful businesses, it was Pablo del Gallego, sixteenth to testify, who had the last word. The Village of New Paltz and the Town of Rosendale, both in Ulster County, have asked New York State to divest the Pilgrim Pipelines from the state pension fund. The campaign to divest from the proposed Pilgrim oil pipelines centers on Ares Management. The Ares EIF Management V account provides the funding for Pilgrim Pipeline Holdings LLC, a Connecticut-based corporation whose principals are both former Koch Industries executives, to move forward with its work — including heavy lobbying in six New York counties and aggressive landman tactics in at least five counties — to get permits for their proposed pipelines while setting the stage for eminent domain taking of private property. About 95 miles of the pipelines’ proposed route would be along the New York State Thruway, I-87, while about 25 miles of the pipelines’ route in New York State would go through private property. “The state Comptroller has exercised his authority in the past in an effort to ensure that the practices of companies benefiting from State pension fund investments are more consistent with the public interest,” she said. Pilgrim’s two proposed pipelines would be drilled under the Hudson River twice and would be drilled under or through 232 other waterways, threatening drinking water for millions. As proposed, the southbound pipeline would carry 200,000 barrels per day of Bakken Shale crude oil, requiring a fivefold increase in the number of oil “bomb trains” coming into Albany every day to service the pipelines, which would run between Albany and Linden, New Jersey. The northbound pipeline would carry refined petroleum products including gasoline, diesel, jet fuel and kerosene. The flow of the northbound pipeline could be reversed, and the type of fuel carried in each pipeline changed, after permitting and construction. Pilgrim has no known contracts with refineries in the Linden area, leading to speculation that the pipelines could be used primarily for export, whether from the beginning or later. It became legal to export U.S. – produced crude oil last fall thanks to intense lobbying by the Koch Brothers, among other major players. The Town of New Paltz, as you may be aware, passed a Resolution Opposing Pilgrim Pipelines last year due to the unacceptable impacts these pipelines would have on public health, safety, climate, drinking water, streams and rivers, economic well-being, and more. In keeping with the leadership role New Paltz is taking to defend our community against the proposed controversial Pilgrim pipelines, and in keeping with at least 28 other New York towns, villages, cities and counties working together to protect our communities, we request that you resolve the dispute over co-lead agency by removing the Thruway Authority from its proposed shared lead agency role. Pursuant to New York State’s State Environmental Quality Review Act (SEQR) regulations, the Town of New Paltz hereby submits our formal request to NYS Department of Environmental Conservation (DEC) Commissioner Segos to resolve the dispute over the designation of lead agency for the Pilgrim Pipeline Project. 6 NYCRR section 617.6(b)(5). Two involved agencies, the New York State Thruway Authority and DEC’s Acting General Counsel proposed, on Dec. 21, 2015, that they serve as co-lead agency for the SEQR review of the proposed Pilgrim pipelines project. The City of Kingston, an involved agency, has now expressed its disagreement with and refusal to consent to this co-lead agency proposal by letter dated January 4, 2016, from its Mayor Steven Noble to DEC Commissioner Seggos and Robert Megna, Executive Director of the Thruway Authority, and by letter dated January 7, 2016, transmitting the resolution of its City Council to the same effect to Commissioner Seggos. In addition, the Town of Rosendale, also an involved agency, has communicated to Commissioner Seggos, by letter dated January 6, 2016, that it remains committed to DEC and not the Thruway Authority as the sole lead agency for the proposed Pilgrim Pipelines project. In addition, the Town of New Paltz, with this letter, also opposes the Thruway Authority being included in the lead agency role, and requests that DEC alone act as lead agency. The refusals of the City of Kingston and towns of Rosendale and New Paltz to consent to the Thruway Authority and DEC’s Dec. 21, 2015 co-lead agency proposal mean that involved agencies are unable to agree on which lead agency will be lead and therefore any involved agency may request, by certified mail, that the DEC Commissioner designate the lead agency for this project. 6 NYCRR section 617.6(b)(5)(i). The Town of New Paltz hereby makes that request. The Town of New Paltz is an involved agency because portions of the Pilgrim pipelines project are proposed to be constructed within the boundaries of the town and local approvals are necessary before that construction could take place. The Town is identified as an involved agency in Pilgrim Pipeline Holding, LLC’s preliminary Draft Environmental Impact Statement dated August 2015 (page ES-&). The New Paltz Town Board, on November 19, 2015, unanimously approved our offer to act as Lead Agency for the SEQR review of the proposed Pilgrim pipelines. We sent that offer, along with our stated opposition to NYSTA as lead agency, to the DEC on November 19, 2015. Information relevant to the Commissioner’s application of the designation criteria that are enumerated in the SEQR regulations at 6 NYCRR section 617.6(b)(5)(v) is presented below. Per the requirements of the SEQR regulations, we are sending this request for the Commissioner to resolve the lead agency disagreement on the Pilgrim Pipelines project by designating the lead agency to all the Involved Agencies along the proposed Pilgrim pipelines’ route in New York State, and are hereby informing them that all comments they may want to submit with respect to the Commissioner’s designation must be submitted to him within 10 calendar days of their receipt of our request. The Town of New Paltz, consistent with its resolution of November 19, 2015, remains firm in its belief that the NYS Department of Environmental Conservation (DEC), and not the NYS Thruway Authority (NYSTA), is the only appropriate agency to serve as lead in the environmental review of the proposed Pilgrim pipelines project. The Town, moreover, has significant concerns about the proposal for co-lead agency, and does not offer its consent for the following reasons. It has been the policy of the DEC to discourage co-lead agency of SEQR processes, and the Town does not see how this case merits an exception. The NYS DEC website states that, “the purpose of having a lead agency is to coordinate the SEQR process so that when an action is to be carried out, funded or approved by two or more agencies, a single integrated environmental review is conducted. This lead agency is responsible for making key SEQR determinations during the review process”—a task made potentially much more difficult when two different agencies are granted joint discretionary authority. The DEC has the appropriate mission, jurisdiction, resources, and expertise to exercise a proper and thorough environmental review of this proposed project. It is the opinion of the New Paltz Town Board that the criteria for a lead agency determination strongly favor DEC. These criteria, in order of importance, include: 1) whether the impacts are of local, regional, or state-wide significance; 2) which agency has the broadest powers of investigation of the environmental impacts; and 3) which agency has the best capacity to provide a thorough environmental assessment. With regard to the first and second criteria, the proposed Pilgrim pipelines project involves numerous potential impacts to resources of local, regional, and state-wide concern, many of which are within DEC’s regulatory jurisdiction. These include the Hudson River and such important tributaries as the Rondout, Esopus, and Catskill Creeks and Wallkill River, the Ramapo River Watershed, State-regulated wetlands, the Karst Aquifer Region (a priority project designated in the NYS Open Space Conservation Plan), Harriman State Park, and other resources that the DEC is responsible for protecting, including, possibly, endangered species (the Karst Aquifer Region, for example, provides critical habitat to the federally-listed Indiana Bat). In addition, a proposed project to construct the first crude oil pipeline in New York must be evaluated within the context of the State’s broader climate goals and the New York State Energy Plan. Governor Cuomo has expressed his intention for New York to serve as a national leader in addressing climate change, and the DEC has statewide responsibility for climate change mitigation. The Commissioner’s Policy mandates that DEC must consider climate change in all its actions, including permitting. In his letter of December 21, 2015, declaring NYSTA as co-lead agency, NYSTA Executive Director Robert Megna argues that the common regional jurisdictions of the two involved agencies are a basis for co-lead agency. We strongly disagree. NYSTA’s jurisdiction, while crossing numerous municipal boundaries, is confined narrowly to use and occupancy of its own property. NYSTA has no jurisdiction over the many environmental and community resources that are potentially put at risk by this project in the event of a spill or other major project impact. The potential impacts of even a relatively small spill could have serious consequences for a community or communities through which the Thruway runs, if it contaminates an aquifer or water body. A preliminary review of the application indicates there is the potential for significant adverse environmental impacts associated with the construction and operation of the pipeline, including but not limited to, impacts to hundreds of acres of forest, regulated waterbodies and wetlands. The Project, as proposed, would implicate the Department’s permitting authority pursuant to the Environmental Conservation Law and the federal Clean Water Act. Both the first and second criteria for determination of lead agency contained in the SEQR regulations strongly favor DEC.
With regard to the third criteria—the relative expertise of involved agencies—the DEC clearly has the greater breadth and depth of expertise needed for this review. NYSTA’s knowledge of highway use and regulation and traffic impacts, while important, is highly limited within the context of a complex environmental review covering surface and groundwater, soils, bedrock and geology, stormwater, air quality, habitat, and climate, among other areas of specialized knowledge and expertise. In past lead agency disputes on energy projects, the DEC Commissioner has pointed to the Department’s large staff of professionals with unique expertise in the many areas of potential environmental impact as favoring DEC lead agency. The same holds true for this project. The rationales for NYSTA lead agency status and for co-lead agency are not compelling, and could undermine confidence in the SEQR review process. Twenty-nine villages, towns, cities and counties municipalities that are considered “potential involved agencies” have already expressed their opposition to NYSTA serving as lead agency and their strong support for DEC serving in this capacity instead. We urge the Commissioner to designate the NYS DEC as lead agency to oversee the critical environmental review for this multi-jurisdictional project. Cc: Robert Megna, Executive Director of the New York Thruway Authority, Governor Andrew M. Cuomo, Federal Highway Administration, U.S. Army Corps of Engineers, U.S. Fish and Wildlife Service, U.S. Department of Treasury—Bureau of Alcohol, Tobacco, and Firearms, U.S. Department of Transportation, Pipeline & Haz. Materials Safety Admin, N.J. Department of Environmental Protection, N.J. Department of Transportation, involved agency municipalities. In the past three weeks, at least fifteen towns and cities in New York State have made public, transparent commitments — the majority with unanimous votes at Board meetings — to oppose the New York State Thruway Authority’s attempt to act as Lead Agency for the environmental review of the proposed Pilgrim pipelines. The cities of Albany and Kingston; the county of Ulster; and the towns of Athens, Bethlehem, Catskill, Coxsackie, Harriman, Newburgh, New Paltz, New Windsor, Plattekill, Ramapo, Rosendale, and Saugerties are now standing up to what Harriman Mayor Steve Welle called a “fox guarding henhouse” attempt by the Thruway Authority to fast-track approval for Pilgrim pipelines’ permit. Pilgrim has recently tried to head off this opposition with a press campaign claiming that their proposed crude oil and gasoline/diesel/jet fuel (refined products) pipelines would be “good for climate”—an assertion that has met with widespread criticism. Metzger pointed out that the rationale for rejecting these pipeline is no different from the federal government’s decision to reject the Keystone Pipeline: The pipelines would encourage expansion of GHG intensive fuel products for the long term, undermining our role as a leader in moving to a low-carbon economy. “It doesn’t take a rocket scientist to see that introducing new crude oil infrastructure with a 100-year life span to New York State is completely at odds with New York State’s energy goals,” Metzger continued. Kate Hudson, Riverkeeper’s Director for Cross-Watershed Initiatives, said that Pilgrim’s premises on climate are incorrect on two levels: “One, building the pipelines would not mean that barge traffic would come off the river. There is no guarantee, nothing that would require it. If the crude oil export ban is lifted, crude will continue to move by barge, rail and the pipelines (if they are built), leading to an increase in greenhouse gases associated with transport, NOT a decrease! “Two, Pilgrim’s study fails to count the greenhouse gas emissions that would result from the oil that its pipelines would transport being burned! The greenhouse gas effect of building an expensive piece of fossil fuel infrastructure in the present that would last 50 plus years would lock us into taking that fossil fuel out of the ground and burning it decades into the future, decades of greenhouse gas emissions. Unless curbed, greenhouse gas emissions will drive our planet over the edge of climate change. Update: On Wednesday night, December 2, Rosendale and Plattekill took the same stand that New Paltz, Saugerties, Kingston and Catskill had already taken in opposing the Thruway Authority’s attempt to grab the “Lead Agency” role. Update: On Thursday, December 3rd, Mike Hein, the Ulster County Executive, issued a statement that Ulster County opposes the Thruway Authority as Lead Agency on the proposed oil and gasoline/refined products pipelines’ environmental review. Ulster County opposes the pipelines being built at all. Hein commented, “It is important to note that the pipeline will not replace the trains,” referring to oil “bomb” trains already endangering New York residents and the Hudson River on their way from Albany, bound for Philadelphia. The City of Kingston, New York, in Ulster County, and the Town of Catskill, New York, in Greene County, both unanimously passed resolutions Monday December 1st 2015, formally objecting to the Thruway Authority’s role as “lead agency” for the environmental review process for the proposed controversial Pilgrim pipelines project. Alderman Bill Carey, chair of Kingston’s Public Safety Committee and newly appointed Democratic majority leader, sponsored the Resolution. “I’m thrilled it passed unanimously,” said Julie Noble, Chair of the Kingston, New York Conservation Advisory Council, after the Kingston Common Council’s 9-0 vote Monday night. “Once again the City of Kingston is helping to lead the charge, as we continue to move in an environmentally sensitive direction, providing leadership locally, regionally and worldwide,” Kingston Alderman Matt Dunn said in his public testimony. “Many organizations here tonight have helped us take this stand against the Thruway Authority’s attempt to inappropriately lead the environmental review.” The formal environmental review process is called SEQR, the State Environmental Quality Review. Kingston’s Resolution recommends the New York State Department of Environmental Conservation (DEC) as the lead agency. “Kingston’s Climate Action Plan, in 2012, set goals of reducing fossil fuel dependency and increasing renewables by 2020. That’s one of the reasons Kingston passed the Resolution Opposing Pilgrim Pipelines in January 2015,” added Julie Noble, who is also the Environmental Educator for the City of Kingston’s Parks and Recreation Department. Kingston Alderman Brad Will said, “I strongly support tonight’s resolution,” adding, “Our next step will be looking at the oil trains barreling through our city.” Pilgrim’s proposed crude oil pipeline would increase, not decrease, the number of oil trains coming through New York State. The Catskill Town Board also voted unanimously, 6-0, on December 1, 2015 to oppose the Thruway Authority as Lead Agency for the environmental review of Pilgrim’s proposed pipelines, and to support the Department of Environmental Conservation as the lead agency. 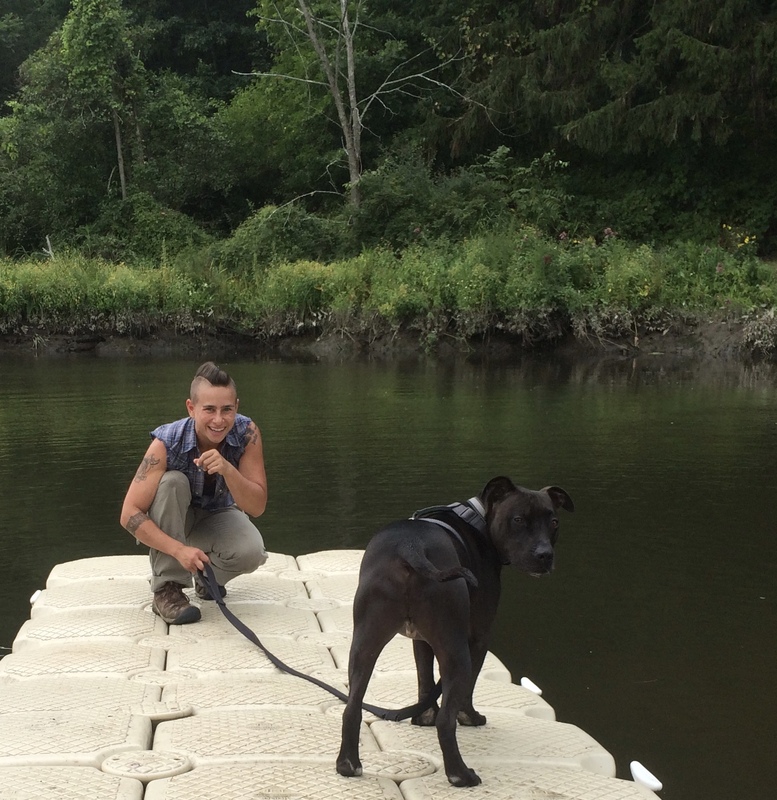 This was the first formal action Catskill has taken to confront the pipelines project. Catskill resident Arielle Herman, who was approached by Pilgrim one year ago because the corporation wants to use her land to build an access road for the proposed pipelines, spoke in favor of the Resolution. She said Pilgrim pipelines would negatively impact land, drinking water, private landowners, businesses and the quality of life in Catskill. “A non-response to the Thruway’s request to be lead agency would be taken as approval for the Thruway to lead the environmental review,” which would be unacceptable, Herman said, urging immediate action. “Pilgrim pipelines would run right through our farm,” said Catskill resident Micaela Bulich. She and her husband own Pathfinder Farms, growing grass fed beef in Catskill. Bulich said Pilgrim has approached them, but Pilgrim “changed their story” several times, changing the proposed maps so that the pipeline route would go through their farm, then would not, and now would. Micaela Bulich and Arielle Herman, both small business owners, commented that the December 16th deadline for all towns to respond to the Thruway emerged right before Thanksgiving, convenient for Pilgrim but challenging for town leaders and residents. “Pilgrim is a for-profit company, and this project is not serving our area. Please protect Greene County,” Bulich said. Fifty-eight towns in New York and New Jersey have publicly and formally opposed the controversial Pilgrim Pipelines being built at all. Resolutions are listed here: www.stoppilgrimpipeline.com. The “conflict of interest” refers specifically to the Thruway Authority’s need for funding for massive infrastructure projects, in particular the Tappan Zee Bridge. The Thruway Authority, according to Pilgrim representative John Casellini, wants to “monetize” the pipelines’ access to the Thruway’s right-of-way, giving them a vested interest in fast-track approval for the proposed pipelines. As proposed, the pipelines would carry fracked Bakken Shale crude oil south, and gasoline, jet fuel, kerosene north, between Albany, NY and Linden, NJ, with 356 miles of pipe, 5 laterals going to the Hudson River and marine terminals in New Jersey; 4 pump stations in New York State, and other infrastructure in New Jersey. The twin 20″ pipelines would each have the capacity to carry 200,000 barrels per day. Pilgrim’s draft environmental impact statement, or DEIS, includes monumental whoppers, such as a statement that there would be no fire risk from the operation of the pipelines. Oil and gasoline leaking from pipelines have caused fires, including fires that have killed people. Pilgrim’s aggressive proposed schedule shows the “construction phase” April 1, 2016, a date widely known as Fossil Fools Day. Oil trains in New York State would increase, not decrease, if Pilgrim pipelines are built. An analysis by Stephen Shafer, MD, MPH, has shown that oil trains coming into Albany would triple in order to service Pilgrim pipelines. Riverkeeper, Citizens for Local Power, Ulster County Executive Mike Hein and others have pointed out that oil trains heading to Philadelphia from Albany would not be reduced if the unpopular, widely opposed Pilgrim pipelines were to be built. Millions of people in New York and New Jersey would have their drinking water put at risk by the proposed Pilgrim pipelines. This includes those who drink water drawn from the Ramapo River, the Hudson River, the Karst Aquifer, the Passaic River Basin, and many other rivers, streams and aquifers. The President and Vice President of Pilgrim Holdings, LLC are both former Koch Industries executives. Pilgrim has never built any other pipeline, so the Koch Industries connection is their only established track record related to pollution and ethics. Koch Industries, owned by the billionaire brothers Charles and David Koch, is the only entity which has funded more climate denial networks than Exxon. Exxon is currently being investigated by the New York State Attorney General for its climate cover-up. Koch Industries received the largest fine in U.S. history, $30 million for 300 oil spills from its oil pipelines. Koch Industries is the largest non-Canadian investor in the exploitation of the tar sands in Alberta, Canada and is a major force behind the current push to lift the ban on export of domestic U.S. oil even as the world struggles, in Paris, to reach modest carbon reduction goals. These modest goals, if achieved but not surpassed, would condemn the world to approximately 6 degrees of global warming, NASA climate scientist James Hansen of Columbia University, said this week. Scientists say the world must keep 4/5ths of the world’s known fossil fuel reserves in the ground to avoid passing the tipping point of 2 degrees. Already, at 1+ degrees, island nations are drowning; heat waves, forest fires, and droughts have become more common; stronger storms combined with sea level rise are hurting hard-hit coastal communities; health impacts are increasing; and ocean acidification, coral bleaching, melting sea ice and warming waters are decimating marine life, from krill to cod.